This Greek Revival wood frame, front gable two story building with brick side wall chimney was built in 1834. The broader gable and lower pitched roof show the influence of the Greek Revival style particularly when compared to the 1816 Episcopal Church next to it. This building has undergone a major transformation from a church to retail space and apartments. Most of the original detailing has been obscured or removed. Currently the building has an asphalt shingle roof. The Methodist Church in Lenox had its beginning in a religious revival held here in 1805. In 1811 the Methodist Church was incorporated. Services were first held in private homes and later in the Town Hall and Courthouse. The congregation grew in size and prosperity. 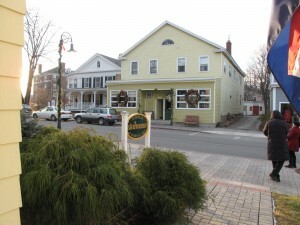 By 1833 construction was underway on this building which was then situated at the corner of Church and Franklin Streets. The new church was dedicated in November of 1834. The Methodist Church enjoyed its greatest popularity in the 1840’s and the Lenox congregation grew rapidly during that period. By 1851 the neighborhood surrounding the Church was deemed too commercial by the Trustees and they decided to seek a new location. Accordingly in June of 1851 a lot was purchased at the opposite end of Church Street and the building moved to this new location. In 1889 the building was repaired and moved again, slightly north to its present location. This move was done to make room for a parsonage, the former Lyman House which was moved from its Kemble St. site when Trinity Church was built. In the late 19th century the Methodist populations shifted to Lenox Dale and the congregation at Grace Chapel grew while the Lenox Village congregation dwindled. 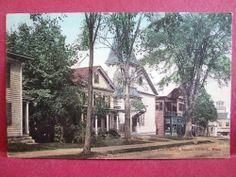 In 1925 the congregations were merged and this building was sold to Mr. and Mrs. Fantini who converted it to secular use. The property was purchased by Albert P. Schuler in November of 1976 and then by Kenneth L. Fowler in August of 2009.